Text messaging can be an extremely useful means of mobile communication, but it can also be a source of spam or abuse. Unwelcome individuals, marketing communications, malware links, service offers, and many other different kinds of unwanted texts can be very annoying and can cost you money if you don't have an unlimited texting plan. Knowing how to block text messages can help you deal with the deluge of unwanted texts and will let you put these problems behind you. Some people rarely (if ever) use texting applications. While living without texting on your phone might not sound appealing to everyone, some people can live without it. If you don't want to send or receive texts, simply contact your wireless provider and opting out of texting service. Verizon customers for example can visit Call & Message Blocking and enter the phone number of the individual that they wish to block. The Call & Message Blocking feature allows users to designate and block up to five phone numbers from sending them text or multimedia messages. T-Mobile also provides Message Blocking features on user's T-Mobile accounts. Most major carriers have some type of similar functionality, which is found within the user account area. Depending on the circumstances and the wireless carrier, the technical support department might have the ability to block certain numbers from texting altogether. For example, texts might be traced to a particular scam or common messages, which may present an opportunity to keep only wanted text messages coming in. It is also possible to block text messages for specific numbers directly from most devices. The method will vary based on the type of phone you have, and not all phone models have this capability. The Android operating system is open source and free, which means that in addition to a number of versions and countless model platforms across the world, hardware manufacturers such as Samsung, Motorola and others are able to tailor Android as they see fit. Depending on the model of smartphone you have, the procedures for blocking texts may vary. Some of the following functions are not universal on all phones, but most models follow these general procedures for blocking text messages. You can use a received text to block future texts from the same number. Hold on that number until the option to block, reject or add to spam list comes up. Future texts from that number will be deleted or put into a spam folder. You can also choose to block texts as they come in. Select the text from the number you want to block. You can use your phone's settings to block specific numbers from being able to text and call you. Select the 'Menu', 'More', or 'Settings' option. Add the numbers you want to block. This will block calls and texts from the offending number. Google Voice is a another Android-based option to use. Similar to native Android text blocking, Google Voice can handle and manage your text messages (as well as calls). 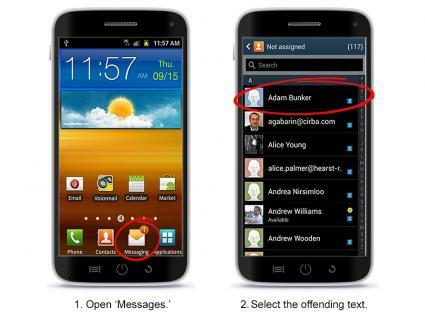 The available functionality includes flagging, blocking, and categorizing incoming and outgoing texts. Google Voice can be browsed on your smartphone browser or the Google Voice app can be downloaded for tighter integration with the phone itself. The Google Play store offers a number of powerful application options that can help block text messages. Similar to Google Voice in functionality, a quick visit to the top rated text-blocking apps can help block and blacklist numbers, most of them are free, others have a nominal cost. If you choose free apps however, it is possible that the application comes with some kind of limitation, such as expiration dates, a limit on numbers that can be added, or advertising support. Popular free titles include VBlocker and SMS Blocker. As with any app you install on your smartphone, check reviews and ratings before you install anything. 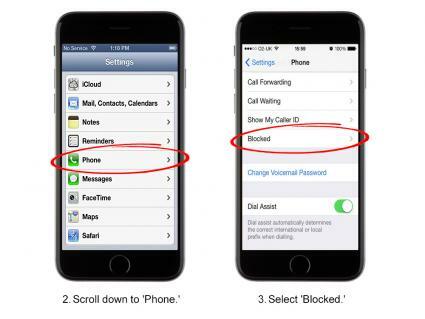 The blocking procedures on iPhones phones are similar to the methods used on Android devices. This section applies to all variants in the iPhone 5 and 6 models, as well as older models that utilize the latest iOS 9 platform. Highlight the number it came from. Hold focus on the number until blocking options appear. From this screen, you can choose to block an individual that is on your contacts list. You can use the Settings screen to block texts on iOS 9. This method allows blocking from contacts without needing to have ever received a text from them. Add contacts from your contact list to be blocked. Windows Phones also feature a simple way to block unwanted text messages within the menu of the phone operating systems itself. 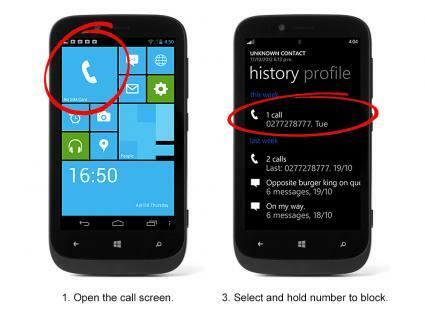 The only caveat is that the Windows method will block numbers entirely from incoming text/SMS and calling ability. These instructions apply to phones that use the Windows 8.1 operating system and some Windows 10 Mobile devices. This method uses the settings menu and allows for repeated entries. 2. Scroll down to 'Call + SMS Filter'. 4. Hit the 'blocked numbers' box to add, review, and edit numbers that are to be blocked by this feature. This method uses your call history to select numbers to block. 1. Open the call screen. 2. Select 'History' so that your list of incoming and placed calls comes up. 3. Select and hold on the number you want to block until a small menu comes up. 4. Select the 'Block Number' option from this small menu. Most problem texts are unsolicited, but there are some steps you can take to prevent unwanted texts. Protect your number. Reserve sharing your cell number to only the most critical functions. Don't respond to texts from unknown numbers. Before responding to online questionnaires, surveys, etc., read the fine print to make sure you aren't unknowingly agreeing to receiving text communications. Opt out of mobile marketing and messaging whenever possible. There is little doubt that unwanted texts can be a pain and in some cases, a costly nuisance. The culprit could be a spam-bot, a mobile marketing system, a disgruntled ex-employee, or a scammer. In any case, know that you can do something about the impact that unwanted texts can cause, saving you time, keeping your information safe, and eliminating clutter in your inbox.